When I tell you that this is the BEST breakfast casserole it is no joke. 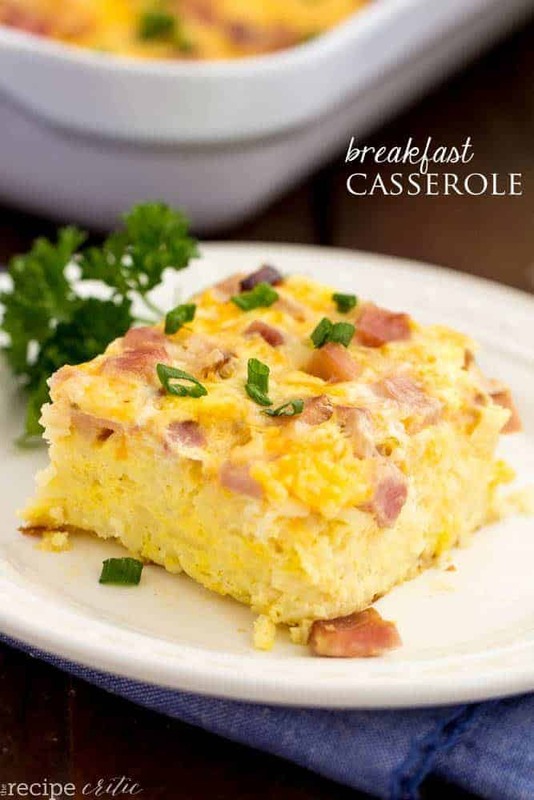 I have made a few breakfast casseroles in my day and this one became an instant favorite! I especially loved this casserole because it was so hearty and full of wonderful breakfast goodness. It is a classic breakfast casserole with amazing flavor. It has hash browns packed right inside which was my favorite part. This breakfast is perfect any time of the year but great for Christmas! You take everything out the night before and throw it in the oven in the morning. It can feed a lot of people which is awesome. I have our traditional Sticky buns on the menu for Christmas along with this amazing casserole. When I made it last week for my hubby and I we couldn’t seem to get enough of it! Luckily it makes a big casserole and is enough to feed a small army! Try it out for yourself! You will agree that it is amazing! 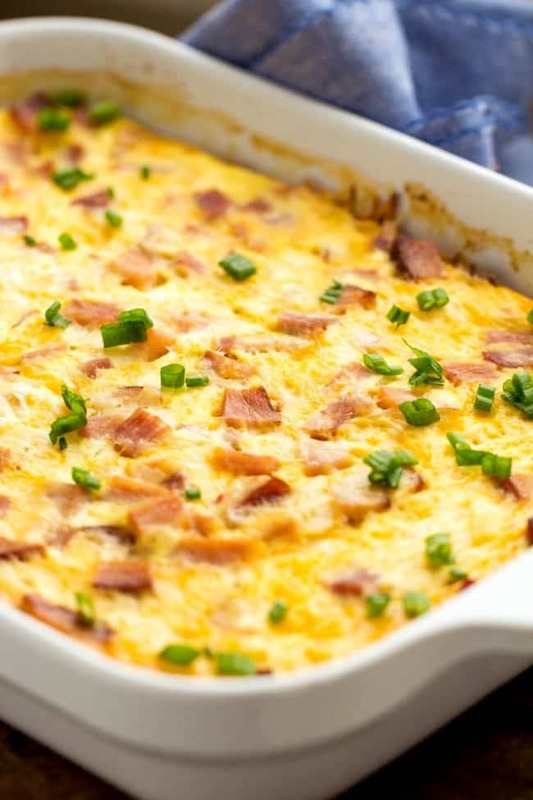 A delicious and hearty breakfast casserole that is the BEST that you will make! Grease a 9x13 inch pan. Add the frozen and shredded potatoes to the bottom of the pan. Sprinkle with salt and pepper. In a large bowl, whisk the eggs together. Then add half and half, season salt, cheddar cheese, pepper jack, and chopped ham. Pour over the top of the frozen potatoes. Cover with foil and refrigerate for 2 hours or overnight. Bake covered in foil at 350 degrees for 90 minutes. Let rest for 10 minutes before serving. If it better to cook/crisp the shredded potatoes first? How do they come out in the finished product? Are they browned? I make this all the time. Place thawed hash browns in greased 9×13 baking dish. Bake at 400 for 20 to 25 min. Let cool for a bit. Put rest of ingredients on top and bake at 350 for 35 to 40 min. I’m excited to make this recipe! Do you think it could be frozen and cooked later? Can you make this ahead and freeze? I froze an egg casserole and it came out really runny. I wouldnt recommend freezing it. Better to make it a day before and reheat. My hint for bacon in anything – chop it up in pieces before you fry it. Makes life so much easier! Meant to say this is a really good recipe! Cant wait to take it to church next week. I will add a little color with peppers. Hoping someone will respond to this thread even though it’s from a while ago! I’ve tried to make this twice now and every single time the middle of this casserole doesn’t cook. I cook it for the full 90 minutes and the center won’t cook. The outside cooks perfectly but the center always comes out soupy and watery. What am I doing wrong? Mine was the same. I baked it for 30 extra minutes, as someone else had mentioned they did, but the last 15 min I baked it with the foil off. Rested out of the oven 10 minutes. I had let it chill in the fridge overnight. Not sure if this was a contributing factor, but I’m guessing not. The frozen hash browns are why it gets soggy. I precious them about half way done so they are defrosted and won’t add water to casserole. You’ve imsespred us all with that posting! Made this for a mother’s day brunch. Used ham, green onion, and tater tots. Tater tots were a great substitution. Everyone loved it! Keeping this one in my kitchen arsenal. I made this last night and baked it up this morning!! Pretty good! I worried that it didn’t look quite done, but after it sits a bit with the foil on it – it finished cooking. I didn’t want to overcook & turn it rubbery – especially since it w/b reheated – my son w/use this dish for his breakfast before work dish! : ) I think next time I will brown the hash brown to give them some color, I know that this w/decrease the cooking time the next morning but w/give it more flavor & a better appearance. I also w/try the lawry’s salt and add some onions to the potatoes. This is a great recipe, easy too!! Thank you for sharing!!! Baked for 2 hours due to runny center. It was good but a little bland for my taste. Might add some onions/green peppers or green chiles next time. Or swap out ham for sausage. I like that it makes a lot so there are leftovers. My family makes this all the time you just put in what you like. It doesn’t really have 2 rest in fridge 2 be good. We use dry mustard in ours Makes it super yummy! I made this today! Just heaven in a pan. I followed recipe exactly. My husband ate with gusto! Thank you so much. This is one of my favorite keepers! I made this today. I made it exactly as the recipe stated. Very good and so easy. Thank you for sharing! Yes, after it is all cooked. Aaaahh…got everything ready to go. Then I read refrigerate 2 hours first! My fault for sure but I wish there was a big heads up! I don’t have the time! $@&%! Going for it. I use obriens hash browns with red and green peppers. Gives it a little more flavor. Trying spinach and Italian sausage next. On the breakfast casserole did you have to to use half n half or can you use whole milk or 2% milk?? It should work but I have not tried it and it could alter the taste or the outcome. Please let me know if you try it. I would love to know!! Can you use o’brian potatoes instead of shredded potatoes? Tried this last night, it was so good! I didnt have enough hashbrowns on hand, maybe 14oz and put sausage and onions in it. So good!! My son loves eggs so I make him one every morning. This is so much easier and he loves it!! Definitely will be making this weekly! Thanks! Could you make this in disposable aluminum casserole dish? All your receipys are very helpful thank you for them. I have made this many times with some variations. Works really well for large family gatherings or holidays. I lost most of my cookbooks in a fire this past year, so I am trying to make up cookbook of favorites. I made this as written and found it to be very dry, crumbly and tasteless. It definitely needs something to make it more moist and flavorful–Mushrooms, maybe? How long would I bake this if I were to halve the recipe? Took two hours to finish baking, but was perfect. Not overdone at all. So easy and good! Delicious and perfect brunch recipe. One recipe fed my adult crowd of 7 with extra large portions perfectly! Thank you! Big hit with work breakfast club – used sausage, bacon, asparagus and sun dried tomatoes. Used cheddar and swiss cheeses. Recommend removing foil for last 10 mins to let the cheese crisp up. Any idea what the nutrition facts are for this recipe? I like to use skinnytaste.com or myfitnesspal.com for any nutritional information. Hope that helps!